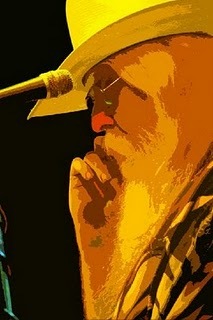 Leon Russell is the unsung hero of the 50’s 60’s and 70’s. The ultimate session man, he has played on, produced, wrote, or somehow had a hand in many of the most important albums in rock and roll history. From the time he lied about his age at 14 to land a gig in Tulsa, playing behind Ronnie Hawkins and the Hawks, to touring in support of Jerry Lee Lewis, to the production and session playing on many groundbreaking albums by Bob Dylan, Frank Sinatra, Ike and Tina, The Rolling Stones, The Byrds, The Ventures, Wayne Newton, Sam Cooke, Johnny Mathis and many records with Herb Albert, he has been most influential. He can also be heard in the background playing piano on many songs of the Beach Boys “Pet Sounds” album, as well as playing on many of Phil Spector’s monumental records. His friendship with Eric Clapton and George Harrison let to them both playing on his debut solo album. Russell was also a major figure on the legendary “Concert for Bangladesh”. The dude was everywhere. According to acclaimed producer, Jack Nitzsche, Leon was always there “for the solos and the fancy stuff.” He has since extensively toured with Willie Nelson and produced early Tom Petty records. But I think what makes this man so cool is his refusal to ever be pinned down to a single genre of music. While others played it safe for the sake of their careers, Leon became known as the perennial rock “ChameLeon”, as fans would call it. They loved it, and critics were confused by it. He has dabbled in country, rock, bluegrass, gospel, circus, jazz, etc…the man is a musical genius. My first introduction to Leon was off of a vinyl copy of his 1971 album, “Carney”. On first listen, Russell immediately evokes notions of the eccentric swamp rock of Dr. John. Without a doubt, I was hooked. Leon is the rock and roll legend that you either love or never have heard of. Probably one of the most underrated names in rock history….. Going camping this weekend and I can’t stop listening to this one (link at the top of page)….